WINONA, Minn. – The Gustavus women’s hockey team traveled to Winona on Saturday to take on Saint Mary’s and tied the Cardinals 1-1. With the tie the Gusties move to 10-5-4 overall and 6-3-3 in the MIAC while the Cardinals are now6-8-5 overall and 3-6-3 in the league. The first 20 minutes of play went scoreless as the Gusties outshot the Cardinals by a tally of 9-8. The Cardinals got the scoring started at the 13:29 mark of the second period to take a 1-0 lead. 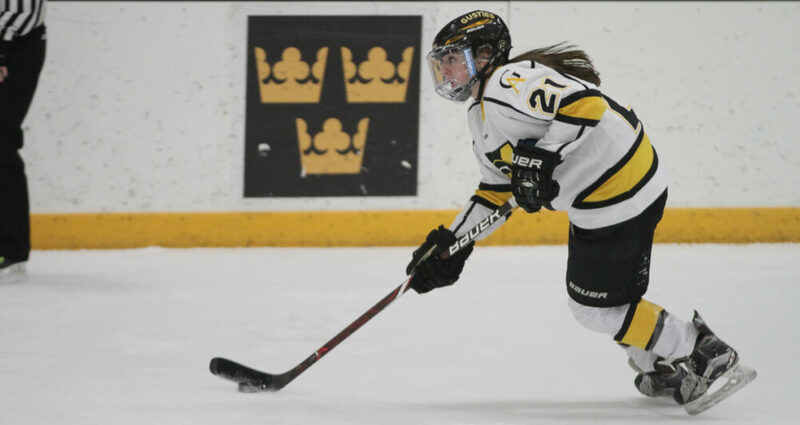 Gustavus answered less than four minutes later though when Lilia Scheid (Fy., Stillwater, Minn.) scored at the 16:46 mark assisted by Allie Stanger (Sr., Paynesville, Minn.) and Amelia Vosen (Jr., Nowthen, Minn.). In period number two the Black and Gold outshot Saint Mary’s 16-4. The third period and overtime went scoreless as the Gusties took 13 shots in the final 25 minutes compared to seven from Saint Mary’s. Amanda DiNella (Sr., Oakbrook Terrace, Ill.) got the start in net and mad 18 saves while allowing the one goal. Gustavus will next be in action on Friday when they host St. Catherine for a 7 p.m. contest.